Ariel Kachuro/Assistant Photography Editor Redshirt senior Vincent DePrez extended his winning streak to four, earning a fall against Harvard and a major decision against Brown. The Binghamton wrestling team extended its winning streak this weekend, traveling to both Cambridge, Massachusetts and Providence, Rhode Island on the same day to compete and dominate over competitive Harvard and Brown University wrestlers. 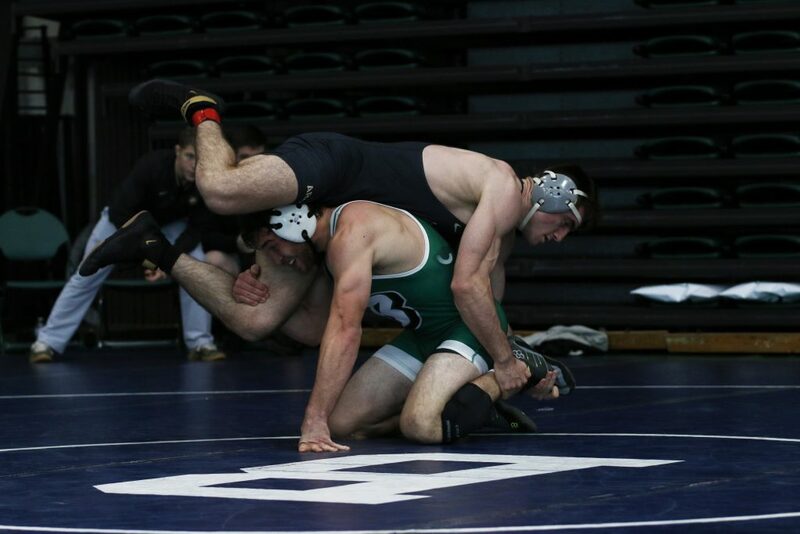 With the performances this past Saturday, the Bearcats move to 4-3 overall and 3-1 in Eastern Intercollegiate Wrestling Association competitions, with four Bearcat wrestlers going a perfect 2-0 on the day. Stepping up to the plate, the Bearcats brought intensity and energy to the mat and showed how much they have worked past early-season losses to pull off the victories this weekend. One hundred and thirty-three-pound redshirt freshman Zack Trampe and 174-pound redshirt senior Vincent DePrez each won their fourth match in a row against Brown University. Trampe took a decision over sophomore Hunter Kosco while DePrez received a successful major decision against freshman Cade Wilson. DePrez also recorded his first fall of the season against freshman Leo Tarantino of Harvard University at 2:54 of the match. Keeping the winning culture alive, 133-pound junior Anthony Sparacio and 184-pound redshirt freshman Lou DePrez each won their sixth consecutive match against Brown. Sparacio received a technical fall against freshman Colin Realbuto and Lou DePrez won a major decision against senior CJ LaFragola. Sparacio was able to outscore his opponents with a score of 33-9 on Saturday, including a major decision over Harvard freshman Tucker Ribman that marked his first bonus point win of the season. In addition, with his own major decision over LaFragola, Lou DePrez added his ninth bonus point win for the Bearcats, four of them coming from his last five matches. Moving into the 165-pound bracket, redshirt freshman Aidan Monteverdi was able to get a three-match win streak with his victory over senior Tyler Tarsi of Harvard. Although he suffered a loss against senior Jon Viruet of Brown, ruining this streak, he fought a competitive sudden victory match and showed his skills against the No. 18 nationally ranked wrestler. Finally, in the 197-pound bracket, redshirt sophomore Alex Melikian earned his first technical fall of the season against sophomore Cole Bateman of Harvard, finishing the day 1-1. Overall, Bearcat wrestlers were able to record technical falls and major decisions this Saturday along with competitive decision victories. The Bearcats’ next dual meet comes this Friday, Feb. 1 at Sacred Heart University. The meet is slated to begin at 7 p.m. from the Pitt Center in Fairfield, Connecticut.